This issue sees the death of Steve Trevor who no longer fitted in with the new creative direction that the Editorial team had embarked upon. 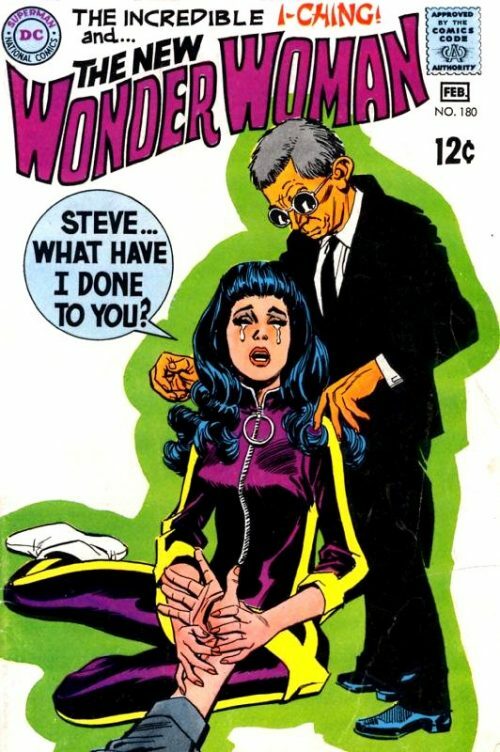 Steve had been in love with Wonder Woman as she had been. 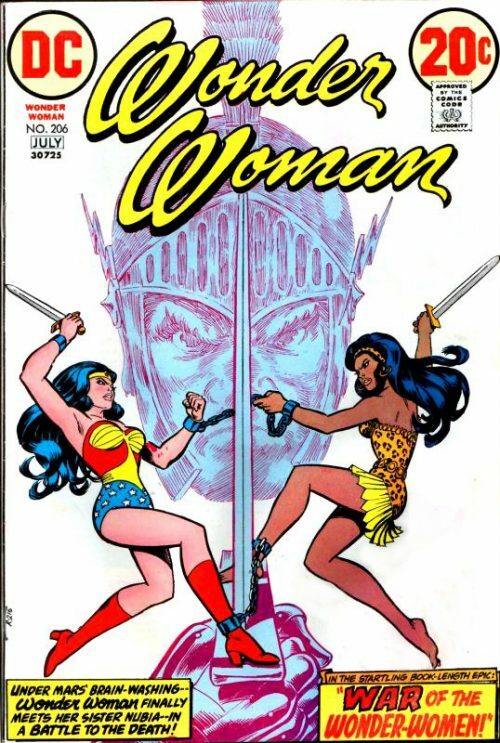 The complications of her suddenly revealing herself to be one and the same as Diana Prince, but now minus her Amazon powers, must have seemed just too convoluted a scenario to carry on with. 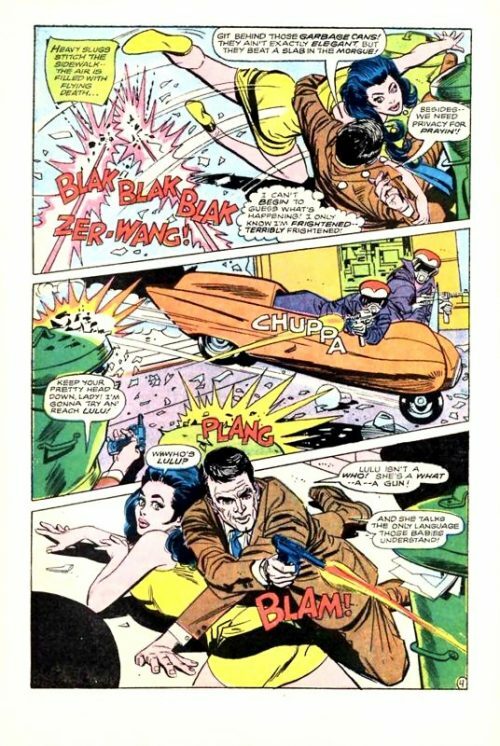 Oh…and this will not be the first time that Steve Trevor dies by the way!!! Diana and I Ching continue down the street as the stranger begins to follow them making sure he remains unseen. However, I Ching whispers to Diana that he can hear the irregular rhythm in footsteps of someone dodging and hiding behind them. He suggests she takes a moment to powder her nose and using her compact mirror, spots the stranger a few yards back. She begins to wonder whether he is one of Cyber’s thugs when suddenly a shot rings out, whistling past their heads! 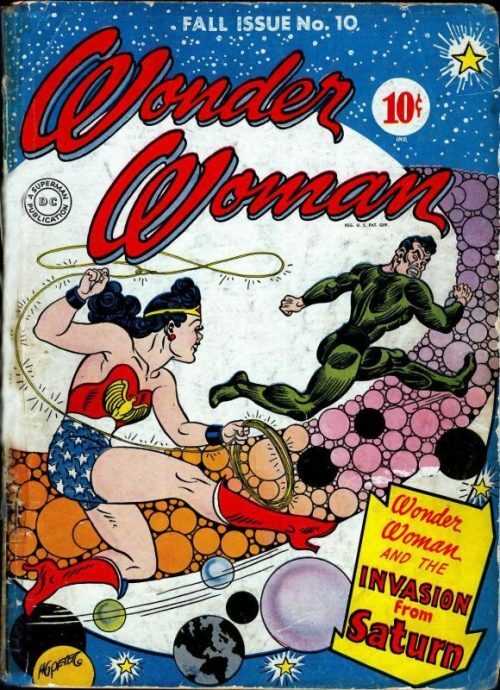 Diana is well aware that she is now vulnerable to bullets without her Amazon powers and immediately springs into action. She turns and clouts the gun from the hands of the stranger before grabbing his arm and wrestling him down to the ground. He tells her he is one of the nice guys and she replies that nice guys do not go shooting people. He explains that he was not trying to kill them but save them instead from Cyber’s goons. Suddenly a three man cycle car smashes through the window of Diana’s shop and onto the street. The armed thugs on board open fire with machine guns and the stranger rolls Diana to safety behind some garbage cans. For the first time Diana actually feels frightened. As the bullets continue to ping around them the stranger picks up the weapon Diana had knocked from his hand and returns fire, all the while using his body to shield the Amazon Princess. The thugs decide to make their escape leaving the two of them to get to their feet. Diana spots I Ching lying on the ground and fears the worst. The stranger checks the old man and says that he has just been nicked by a bullet and it is nothing serious. He picks up I Ching and suggests they go back to her place to patch him up. Once safe inside she asks the stranger who he is and he replies that his name is Private Detective Tim Trench. As she attends to I Ching’s wound he explains that a mole of his had told him how Diana and the blind Chinese Man were looking for Cyber. So is Tim. Diana asks why and he tells her that one of Cyber’s hoods shot his partner and that he is after revenge. He asks what her interest in Cyber is and she replies that Cyber had shot her friend Steve Trevor. He is now currently in hospital at death’s door. Just then the groggy Ching sits up and welcomes any help in tracking down Dr. Cyber. Unknown to the three of them, a hidden surveillance camera installed in Diana’s apartment relays the scene back to Cyber’s lair, hidden on the ocean’s floor. 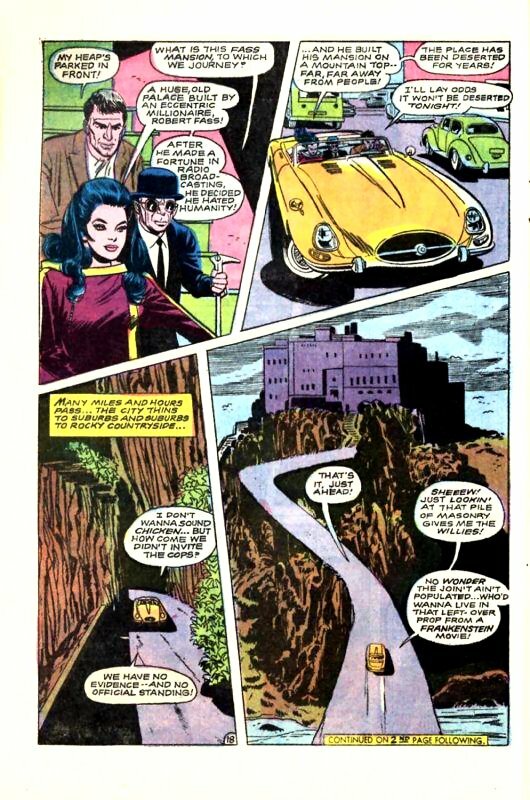 The villain, concerned by the pooling of their resources, decides that Diana’s death will discourage her companions and orders it to be done immediately! Unaware of her imminent peril, Diana continues her conversation with Tim Trench and I Ching. Tim says that they have no real idea who this Cyber is or where to find them. The Amazon suggests that having stolen all the rare gems after the raid on Ching’s Monastery, some of them will have to turn up on the open market at some point. Tim agrees and says that they simply need to keep a watch for “hot ice”. He compliments Diana on her quick thinking and while I Ching concurs, he adds that she is still like “the clay of the sculptor – unformed”. She must resume her training at once. And so it begins again. The relentless conditioning…the muscle wracking excercises…as I Ching teaches his eager pupil ancient secrets…techniques which make of the human body an instrument of more than human power. Tim watches the training intrigued and one day, while sitting in a chair, he comments that he prefers a gun any day. To demonstrate, he pulls out his gun and asks her what on earth she can do when this happens? In answer, she bends over backwards, like a limbo dancer, beneath the line of fire, before performing a back flip which puts her hands on the chair legs. She then topples him over and pretends to chop him in the larynx, ending the fight in her favour. 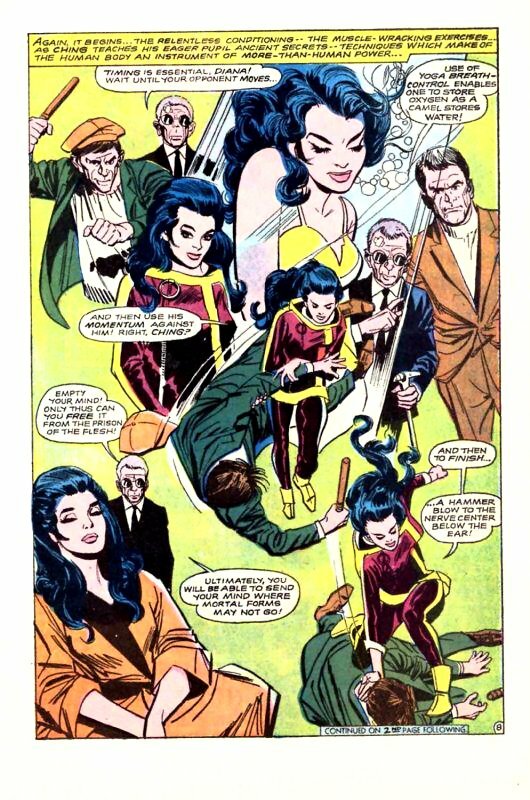 Tim is suddenly convinced by her skills and the unwitting detective remarks how Diana comes on like Wonder Woman! Just then the phone rings and Diana answers it. It is the hospital to says that Steve has taken a turn for the worse and is asking for Diana. She tells them that she will get their immediately and makes her excuses to I Ching and Tim! She rushes outside and hails a passing taxi, asking the driver to hurry to the hospital as quick as possible. The driver sinisterly remarks that it must be “a matter of life and death”. As they make their way through the city streets Diana notices that they seem to be heading in the opposite direction to the hospital. She says to the driver that they must have misheard the destination but the driver replies that she had heard Diana quite clearly, just as the Amazon had heard the comment that it must be a matter of life and death. In fact…Diana’s death! Suddenly a glass wall slides up between Diana and the driver and realising it is a trap, tries to force open the doors with no success. As the taxi accelerates towards a dead end the driver turns and removes their cap to reveal a girl. She smiles at the trapped Amazon princess and says that on behalf of her leader, Dr. Cyber, she bids Diana goodbye. With that she leaps from the moving vehicle as Diana’s desperate plea for help is lost in the splintering of the barrier. The taxi hurtles off the pier and splashes into the water. From Cyber’s hideout, the villain watches on screen as the taxi quickly sinks and muses that Diana might have been a useful ally if she had not chosen to attack! A minute passes…then two…silently the ripples fade as the dirty river becomes Diana’s grave! Meanwhile on the dockside Tim and Ching screech to a halt in their car. The detective tells the Chinese man that his hunch had right and that there was no hospital within miles of this dock. But he still cannot understand how Ching could follow the taxi by hearing alone. I Ching tells him to focus on the matter at hand and asks whether he can see Diana anywhere. Tim sees the hole in the barrier at the end of the pier and fears the worst. Ching says that they must act quickly to save Diana but before they can even get out a couple of jeeps filled with Cyber’s goons approach! As the helmeted thugs attack with batons, Tim and I Ching defend themselves. Tim manages to floor one of the hoods and removes their helmet to see a pretty girl. Surprised, he hesitates and she uses the opportunity to draw a pistol! At that instant on the river bottom, Diana is struggling for her life! The doors are still jammed so she tries to break them with a karate blow. But she can gain no power swinging her arm through the water and she panics that she is simply going to drown here like an insect. But she quickly chastises herself and remembers her training. She tells herself to conserve her air and think calmly and clearly. There has to be another way out of the taxi. Back on the dockside Tim asks whether the girl is going to shoot him or not. She replies that their orders are not to kill the two men unless necessary. Just then another of Cyber’s hoods approaches and says that Diana Prince has been submerged for over ten minutes. She must be dead by now and their mission is therefore accomplished. With that the gang get back in their jeeps and drive away leaving Tim to curse himself for not saving Diana. But Ching says he can hear Diana’s voice coming from below. A few hours later after Diana, Ching and Tim have had something to eat, the phone rings again and the caller asks to speak with Diana. The voice on the other end says that they have information about Dr. Cyber and for Diana to meet the caller at midnight at the Fass Mansion. After agreeing and hanging up, Diana is told by her companions that she will not be going alone – a viper like Cyber may strike at her again. As they make their to the car, Ching asks about the Fass Mansion and Diana explains that it is a huge old palace built by an eccentric millionaire named Robert Fass. After he made a fortune in radio broadcasting he decided he hated humanity and built the mansion on a mountain, far away from any people. The palace has been deserted for years. Many miles and hours pass as they drive out into the rocky countryside. Soon they are approaching the imposing Fass residence and once parked up, cautiously step inside the darkened mansion. Entering the hallway they hears a noise from upstairs and suddenly see Steve Trevor running down the stairs, still dressed in his hospital garments. He yells down at them that it is all a trap but is mown down by a machine gun from behind! As they race up to where he lays, Diana grabs him in her arms and he weakly tells her that he had been snatched from the hospital by Cyber’s goons. She tells him not to talk and to conserve his strength as Tim draws his weapon and decides to check upstairs. Diana weeps and says to Ching that Steve’s skin feels so cold. She cannot detect any breathing anymore either! She sobs how “a death for Diana” actually meant Steve’s death. She has lost everything! Without her mother, her Amazon sisters and the man she loved her life is worthless! 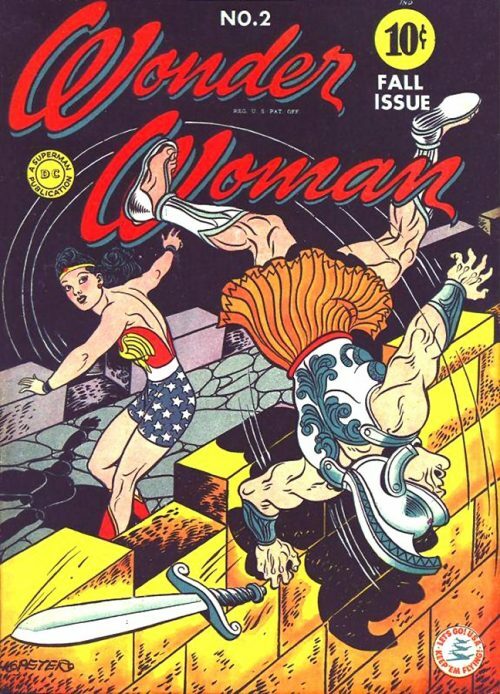 Ching tells her she speaks foolishly but in full fury, Diana sprints up the stairs intent on destroying Cyber! Numb with rage and despair she enters a chamber to see Tim under attack from a mob of Cyber’s hoods. She is determined not to lose another friend tonight and unleashes her fury like an avenging Goddess. Diana leaps forward feeling nothing except a consuming hatred. With inhuman strength and swiftness she sweeps through her enemies. Moments later I Ching reaches the battle ground and joins in the melee. Panicking, the remaining few members of the mob makes their escape under the cover of a gas grenade. A minute passes before Diana can see more clearly by which time their quarry has disappeared. She asks if Ching is alright and he nods, but adds that it appears Tim has been captured and taken prisoner. He then lifts a sheet to reveal that he has managed to overwhelm one of Cyber’s female thugs. 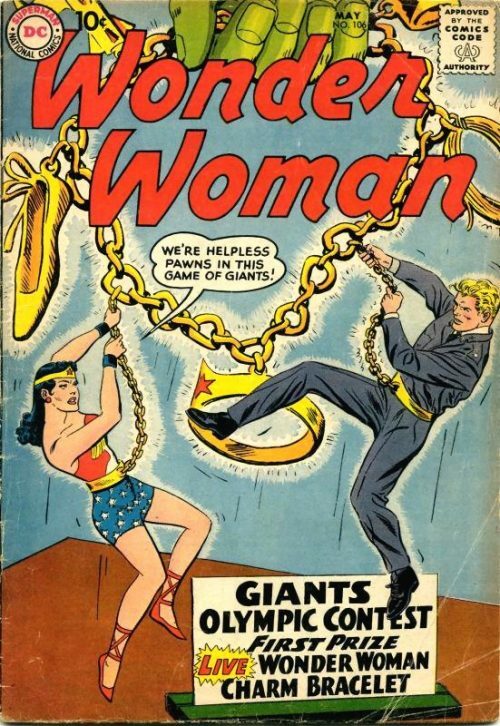 The girl spits that she will tell them nothing but Diana grabs her by the scruff of the neck and raising her fist, growls that the girl has two seconds before she smashes her face in. I Ching rebukes her for using violence to get their answers and says that they can use hypnosis instead. At that instant beneath the mansion, a tiny submarine makes its way towards an underwater tunnel. For several miles it proceeds along an underground river before finally emerging into the ocean. It is pulled into an airlock and comes to rest in Cyber’s underwater headquarters. Soon the crew stand before Cyber holding the groggy form of Tim. They tell their leader that Diana Prince had managed to elude them although they had snared her companion. Unfortunately, their enemies had managed in turn to capture one of Cyber’s hoods. Cyber replies that anyone who allows herself to fall into hostile hands deserves her fate. The villain then beckons them forward so she can get a closer look at Tim trench. As she lifts his head he sees a beautiful woman smiling down at him. She welcomes him and introduces herself as Dr. Cyber!! !